Restaurant Wars is the crazy halftime show of any Top Chef season, marking the halfway point and, typically, where the going gets good. Half of the initial chefs are gone, and the producers throw the remains into one of the toughest challenges they can muster: opening a restaurant in 24 hours time. In teams, the chefs come up with a concept, plan the menu, decorate the restaurant, and most important, execute and expedite. It's bigger than other team challenges because the chefs don't just cook their own dishes, they have to adopt various roles in the kitchen and work together to make things go smoothly—and things rarely go smoothly. But the other reason Restaurant Wars is so enjoyable each season is that it really does signify a turning point. By now, we usually have a real sense of the chefs and their styles, and theoretically, a vested interest in who should take the win. To weigh in here at halftime, I'd have to say this season is falling short of the mark for a couple of reasons. One, we've had too many team challenges. Restaurant Wars ordinarily provides us with our first vicious fight, meltdown, or gives us a look how chefs behave professionally under pressure. This season, we've already had that in spades. By this 20th time everyone beats up on Bev, I'm pretty well sick of it. The teams all yelling at one another is expected at this point. Stemming from the too-many-team-challenges problem is that we haven't had many chances to see the chefs do their own thing. There are still several in the mix that I don't have a great feel for yet (Lindsay, Ty-lör, Paul, Grayson). Personality, sure, but less so for their styles in the kitchen. Bravo's managed to deliver the drama this season, but at the expense of the cooking. Out the window this episode was the Quickfire, handing over the entire hour to the elimination challenge. 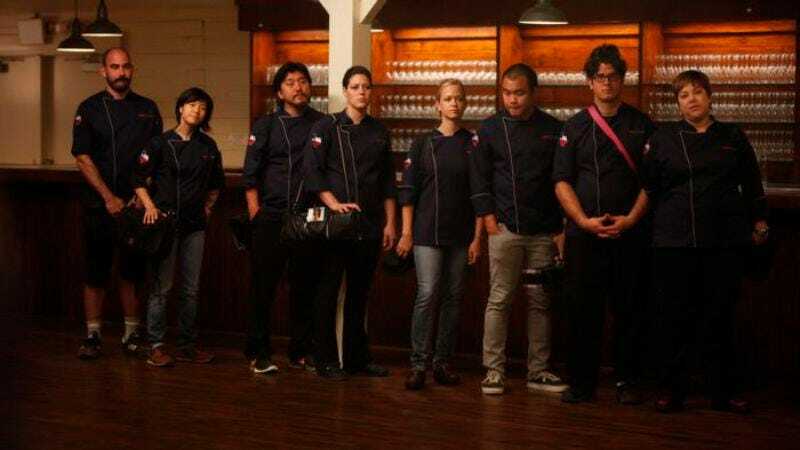 Padma divides the chefs into teams along gender lines, and they have 45 minutes to pull together a plan. The menfolk settle on "Canteen," a low-key restaurant that fancifies humble origins. On the plate, this means transforming ham-and-eggs into a ham-and-pork paté that diners have trouble likening to the original. Meanwhile, the women go for a refined-but-rustic feel for their restaurant, Half-Bushel. Back this season is the emphasis on décor; not only does the front-of-house person have to have a hand in a dish, train the servers, and seat and manage the floor, but they've also got to find the time to set up the entire thing. Also different this season is the staggering of the restaurant nights. Instead of cooking in two locations at once, the chefs are split over two days. Padma flips a coin to see who goes first, and that first presentation has to come at a significant disadvantage. The show didn't air any footage of the women having extra time to think and plan, but surely an extra 24 hours had to help. They also went into their service having sat through the men's service—they had the chance to see mistakes, gauge the judge's reactions to their competition, to taste the food, etc. It seems like a huge advantage, one that went completely unmentioned in tonight's cut. It doesn't look like the girls learned anything from the boys, though. The boys' first mistake was overlooking a critical kitchen function—the expediting process. Their service fell apart when they fumbled early on. But in the end, service didn't matter all that much. Tonight was decided on food alone. That said, the judges seemed to take particular pleasure in making the chefs squirm. They were almost giddy about it, barely able to conceal their delight during some of tonight's meltdowns. So many of those cuts showed them smirking while offended, demanding courses or sucking down lemonade with feigned hostility. Restaurant Wars is ridiculous. Everyone knows it, which is why everyone looks forward to it. Had the food been amazing all around, the judges surely would have pointed to the service. Front-of-house folks have taken a major beating at the judge's table in past episodes of Restaurant Wars. It's one of the riskiest responsibilities you can take on this challenge. (Aside from the fabled dessert, of course.) But here, the boys delivered mediocre food in a good atmosphere, and the girls did the opposite. Their service was a total disaster—and their teamwork frankly unpleasant to watch—but the food, once it arrived, landed them on top, magically turning evil, Bev-hating Lindsay into smiling, Bev-congratulating Lindsay. Of the guys, I thought it was Chris' time to go. As the judges pointed out, he didn't seem to do much in this challenge, and what he did wasn't impressive. As I said last week, I love Chris for how faithfully he goes after his ideas, but he's not really delivering. He needs a good editor. Alas, it was Ty-lör's turn to pack his knives, having underseasoned both the dishes he was involved in. Hapless underdog Beverly takes the win for the ladies' team, and I'm rooting for her to make it to the finale. — No more circle-jerk expediting, guys. — If I had to guess a final four, I'd bet on Sarah, Ed, Paul, and Bev.